Contiguous with the restricted forensic workspace, the Anthropology Department maintains a large teaching space where classroom instruction, public outreach programs and training events are held on topics across our sub-discipline. 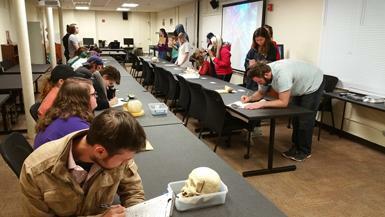 The BAFAL Education Coordinator maintains student-led workshops for anyone interested in hands-on examination of skeletal material, casts, and samples illustrating the evolutionary origins of humans and other primates as well as experiential learning sessions on the analysis of forensic remains. BAFAL provides organized training programs in bone biology, microstructure, and biomechanics for students of anatomy and physiology or professionals interested in research or clinical medicine. Similar training sessions on human origins and forensic anthropology are available for law enforcement and medicolegal investigators. For more information on upcoming training opportunities, please contact the Lab Director, Dr. Corey Maggiano, by email at cmaggian@westga.edu. BAFAL is located in the Old Auditorium Building, adjacent to the Anthropology Building on the south side of campus, and is easily accessible via Back Campus Drive. Forensic Science is a growing field and offers an excellent point of entry for students interested in combining social and scientific method and theory. Although Forensics is a diverse discipline with multiple areas of study, the goal of this certificate is to use lecture, lab, and field work to prepare students for careers in Anthropology, Biology, Chemistry, or Criminology. Interdisciplinary and practical training in Forensic Sciences offers high-quality employment opportunities in the private sector and in federal, state, and local agencies including law enforcement, The Joint POW/MIA Accounting Command, The Bureau of Alcohol, Tobacco, Firearms and Explosives, and state and federal bureaus of investigation. 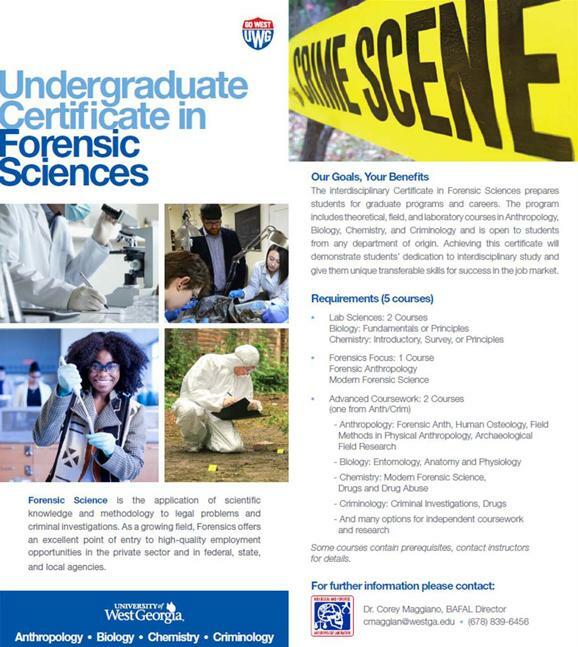 The program offers a flexible path towards completion for students from any department of origin and with any previous level of experience in forensics. Achieving this certificate will give our students an edge in today’s highly competitive labor market while encouraging a positive social contribution and commitment to community. The wet lab is outfitted with a full complement of equipment necessary to process and analyze remains that are skeletonized, decomposed, burned, fragmentary, or otherwise unidentifiable through traditional autopsy. 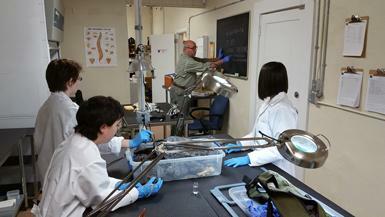 The BAFAL staff can aid in distinguishing human from nonhuman bone to reduce error and to help focus the investigation. In cases involving nonhuman bone, the lab can assist in identification of the taxon, age and seasonality of death, as well as perform trauma analysis in cases of animal cruelty. The BAFAL is responsible for the curation and deployment of the Anthropology Department’s comparative osteological collections, which include a series of and high-quality primate and paleoanthropology casts, forensic skeletal casts, a collection of human natural bone specimens, and a small collection of faunal remains. The closely supervised student staff assists with cataloguing the collection, participates in research on osteological materials, and observes forensic analysis when authorized by the presiding jurisdiction. BAFAL is dedicated to creating new opportunities for student learning and research collaboration. We are always looking for interested parties from academic, medical, and dental businesses and institutions with which to build new alliances. If you would like to help us create mutual opportunities for students, patients, clients, or the broader community, or if you have events or services you’d like us to participate in do not hesitate to contact us. BAFAL’s educational, research, professional, and community service missions, also benefit greatly from community private or personal contributions in the form of tax deductible monetary donations and the temporary or permanent curation of teaching materials. Any parties interested in donating funds or materials are highly encouraged to contact the Lab Director, Dr. Corey Maggiano, by email at cmaggian@westga.edu.